The most infuriating thing about the 2012 Christian film God is Not Dead is not that it’s an email forward of a film. Nor is it that I am not a Christian, and therefore this movie isn’t for me. No, it’s simply that this doesn’t have to be so appalling, no matter the yay-Jesus sentiment. There are numerous dodgy side plots including a Muslim girl who wants to find Jesus (and who wears short sleeves and a sloppy hijab, which I suppose is possible, but sure didn’t look like anything I’ve seen), a woman with cancer (and an I <3 Evolution bumper sticker, which sure seems like a Real Thing a Secular Human Would Have) and various other tedious cardboard cutouts in vaguely human shape. 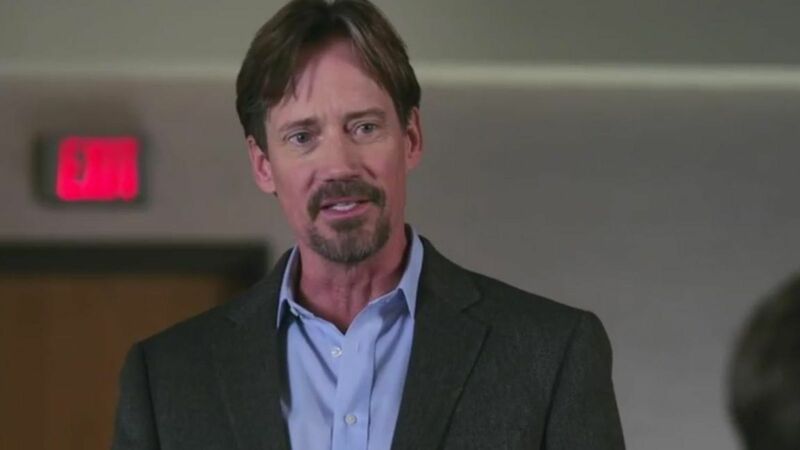 The main event, however, is the battle between painfully clean cut college student Josh and his villainous, atheist, philosophy professor played by Kevin Sorbo, who is both the best actor and the least believable person in the movie. This kind of activity would make you a bad teacher, especially in a setting where it’s not about factually right or wrong answers. This is a cheap, plastic way of making the prof the villain. Instead of making the debate truly rhetorical and religious, the menacing secularism has to be browbeaten into everyone. And maybe it’s some kind of metaphor for the world at large, but within a classroom setting, it’s terrible and false. In short, this makes even the staunchest atheist want to root for Josh for contrarianism’s sake. (I also want him to call Fox News, Breitbart, and Rush Limbaugh and become a national news story, because that would totally work). So, the young, earnest lad decides to fight his professor and debate in front of the class. He’s much too good at it, yet it’s also completely muddled and nonsensical. His metaphor-for-Christians-who-don’t-want-to-make-waves-in-the-secular-world girlfriend is pissed off and dumps him. But Josh soldiers on. Oh, and professor has a beautiful, Christian girlfriend. She frowns a lot because he’s such an atheist. The end — spoilers — is the worst. First of all, Josh appears to have converted almost his entire class to Christianity at the end of his final debate. This is, ironically for such an anti-secular movie, pure Hollywood claptrap. Wouldn’t it be more fitting if after class, one shy student came up to him and asked him for more info about Jesus? Then Christians would know that this wasn’t some fairytale confirming all that they believe, but that bringing people over to the Lord takes some work. The film appears to be telling Christians that if they just stand up for God in class, they’ll convert heathens by the dozens. A little humbleness about the state of this here fallen world seems more appropriate and better then this wish-fulfillment. Prof Hercules had his own reasons to disbelieve in God. However, at the end, to the sounds of the Newsboys’ Christian rock jamz, he gets run over by a car conveniently next to these pastor and his friend who had had car trouble in the earlier film. It was meant to be, see. Hercules comes home to Jesus as he dies in the street. Yep. He converts, thanks to the pastor, but he still dies. And presumably directly in front of his bloodied corpses, the pastor stands in the rainy streets smiling because at least Prof is home now, and someone has even texted him “God’s not dead.” (“God’s not dead — but you are” more accurately.) The pastors or pastor and friend (I forget/who cares) then exchange a line about how “what happened tonight is a cause for celebration. Pain yes, but only for a few minutes. Then, think of the joy of heaven.” Okay, but can you not smile so wide directly in front of the dead man smeared across the street? Can we not immediately be quite so delighted? Horrible, robotic inhuman attitudes permeate this movie, and this ending is the capper. There is no sadness that a man who was just coming around to the Lord, and you know, was a human being in addition to that, is dead. They’re all happy about it. This is one reason why the non-religious find religion — and religious films such as this — cold. How about a little respect for this life, not just pleasure in leveling up to Jesus? When we’re talking about Jesus, songs are so much different than movies. Suburban Christian rock songs may not be. But painful country music can be beautiful, human, and accessible to the non-Christian just because of the depth of feeling (or even the wrath, if you have the Johnny Cash voice to match God cutting us all down sentiments). Perhaps because Professor Hercules losing his mother is what made him lose his faith, and this tune is about the very same tragedy, I found myself thinking about “Can The Circle Be Unbroken” after watching God is Not Dead. First recorded by The Carter Family in 1927, the song has been played many times by many people, but that trio’s version is it for me, because it’s just so brutal. Often in later covers the song is played more as a cheerful, hopeful gospel number. The circle will be unbroken by and by. Everything will be alright. The Carter Family were not so sure. Maybe — maybe “by and by” they’ll all be together again in heaven. They do believe that. But that doesn’t stop their pain now. It doesn’t even stop the dreadful grief of wanting to keep the body of the loved one. The body is just a vessel, right? The soul is gone to heaven. And they still hate to see what’s left of her go. That sort of religious feeling — that sort of spreading of a message that says, yes, we’ll probably be in heaven later, but it sure is awful now — is worlds away from the self-satisfaction of God is Not Dead. Religion is supposed to fill those holes in your heart that appear when, oh, say your dear mother dies. I fail to see the good in it if it morbidly cheers the death of someone — even someone who has finally found Jesus. The most infuriating thing about the 2012 Christian film God is Not Dead is KEVIN SORBO IS HERCULES WHY DO THE CHRISTIANS WANT TO TAKE THAT FROM ME. Christians take everything from me. Listen, Xenia is better anyway. I knew that was spelled wrong. But YEP. Kevin Sorbo also was Ryan’s long lost dad on “The OC” I think. But the short best friend was part of my sexual awakening also Gina Torres. Also I never watched Xena idk. ALSO but Bruce Campbell was in both and was aaaaaaaaaaaaaaaamazing. Do you remember when Bruce Campbell was on EVERY syndicated TV show and had like 4 of his own and they were all PERFECT because its Bruce Campbell? I feel like when that happened, I didn’t know his chin from any other notable chins. NO I TAKE IT BACK GODDAMN YOU I JUST WENT ON FACEBOOK GODDAMN YOU STEIGERWALD. I haven’t written anything in like a week. Facebook is not helping with that.